When a motorcycle crash victim arrived at Longs Peak Hospital, it was exactly what the trauma team of the new hospital had been so relentlessly practicing for. Dan McFarland, 40, had been riding motorcycles since he was 19. He loved his black 2015 Harley Sportster. On a nice June evening, McFarland headed over to the home of John Lawley to tinker on motorcycles in the garage. Dan had just dropped off his 10-year-old daughter at a movie theater. She was going to see Jurassic World with John’s wife and son. 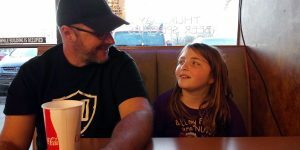 Dan McFarland has a little daughter time with 10-year-old, Lucy, four months after his motorcycle crash that nearly took his life. Photo courtesy of the McFarland family. The two dads worked in the garage on John’s 1995 Honda Shadow, a bike that Dan had sold to John, his friend for more than 20 years, a few years prior. Late that night, while the kids and John’s wife were still at the movies, Dan and John decided to take a short ride to test the repairs they had made. A few minutes before 10 p.m., they headed down County Road 1 in Longmont — a nice open road — when an SUV took an illegal left turn. John hit the SUV first, then Dan’s bike collided. A half-mile down the road at UCHealth Longs Peak Hospital, operating room nurses and technicians had conducted regular practice drills since opening in November 2017, so they’d be ready for any trauma. As a Level III trauma center, LPH isn’t required to have a neuro surgeon on call 24/7, but hospital leaders decided a few months earlier that such a service was vital in caring for their community. 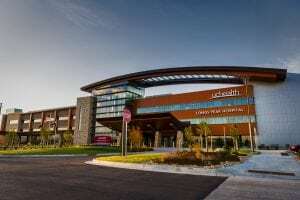 UCHealth Longs Peak Hospital in Longmont, Colorado. Photo by UCHealth. That night, Longmont EMS rushed Dan to the hospital, where Dr. Derek Leopold was the trauma surgeon on call. Leopold quickly placed a call for Dr. Tripp Nanney, the on-call neuro surgeon, to come to the hospital. If Dan had any chance, Dr. Nanney would be instrumental. Upon arrival, Dan was comatose and demonstrating signs of brainstem herniation, which occurs when brain tissue moves inside the skull, in this case, pushed by an expanding brain clot and swelling, Nanney explained. 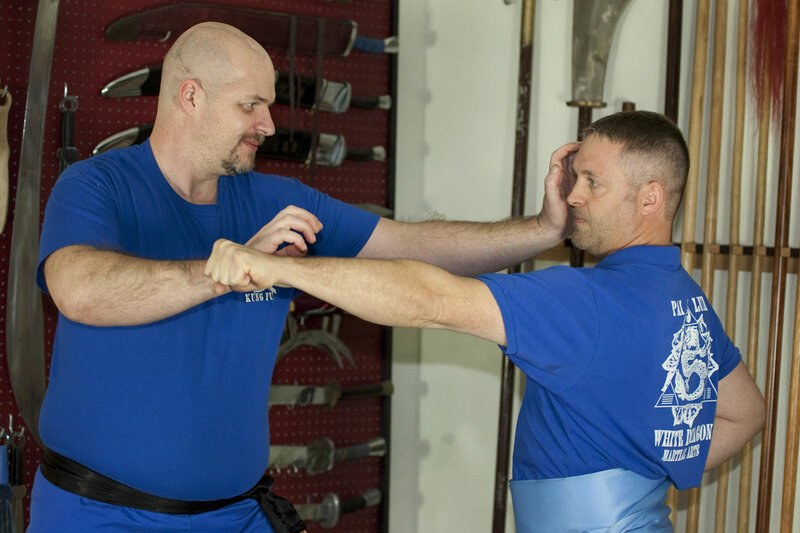 The injury is very serious because it affects the part of the brain that controls breathing and heartbeat. If that area of the brain is compressed, it can be deadly. Melanie McFarland got the call about the crash just before 11 p.m. She arrived at the hospital within minutes. Dan was in surgery and would be for hours, into the early morning. When Dan’s mom arrived, Melanie left the hospital to go pick up their daughter at John’s home. She was still unsure what had happened to Dan’s friend, but she arrived at their home at the same time as a police officer, who came with sad news. John had died in the crash. Melanie and her daughter headed back to LPH to find out that her husband was still alive. The McFarland family from left, Melanie, Lucy and Dan. Photo courtesy of the McFarland family. Dan, a self-taught information technology guru, made it through the first surgery, but he would need more surgery to stay alive. He was transported by UCHealth Lifeline helicopter to UCHealth Medical Center of the Rockies, a Level II trauma center in Loveland. Somehow, in her shock and grief for John, Melanie managed to begin writing Dan a letter. She was inspired by “50 First Dates,” a movie in which Adam Sandler’s character creates a video to help his girlfriend, played by Drew Barrymore, remember what’s happened in her life after she suffered a traumatic brain injury. Every day, Melanie chronicled their journey, writing about Dan’s condition, his visitors and her own thoughts. In time, the letters, photos and other memorabilia, were placed in a book that she hoped she would share one day with Dan. Melanie had worked with TBI patients before in social services roles — a career path she believes was preparing her for the rollercoaster ahead. Melanie and Dan married more than 11 years ago and had a daughter together. But five years into the marriage, they divorced. They recently rekindled their romance, and Melanie had moved back in with Dan. Melanie created a Facebook support group called United We Stand for Lawley and McFarland, which she used to update friends and family on Dan’s condition and to rally the community to attend memorial rides and fundraisers to support the two families. Five days after the accident, Melanie wrote that Dan opened his eyes for the first time. She also shared a photo of him. 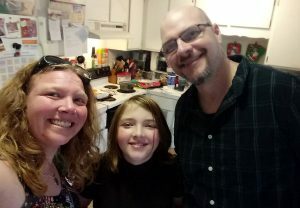 The support from nurses, friends and family helped her and her family, including Dan’s 21-year-old daughter, through the first few days, and weeks that followed. “I wouldn’t have been any amount of sane without the incredible ICU nurses,” she said. “The nursing staff made the difference for me as a caregiver. I always knew what was going on. Each day, Melanie wrote letters or posted on Facebook. On June 30 — 10 days after the crash — a memorial service was held for John. She tucked John’s funeral service program and newspaper clippings about the accident into her book. Sharing the news with Dan would have to wait. 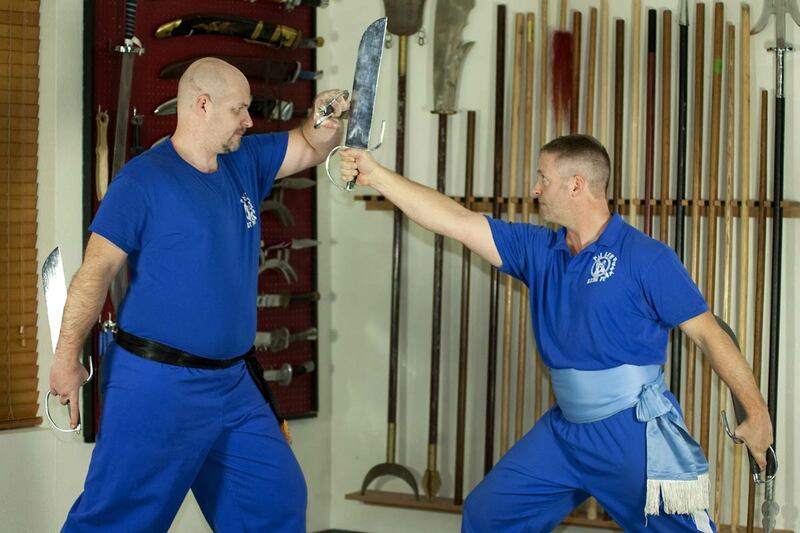 Dan McFarland’s scar where his skull had to be removed to save his life, is visible as he practices Kung Fu at Pai Lum White Dragon Martial Arts in Longmont. Photo by Joel Blocker Photography. 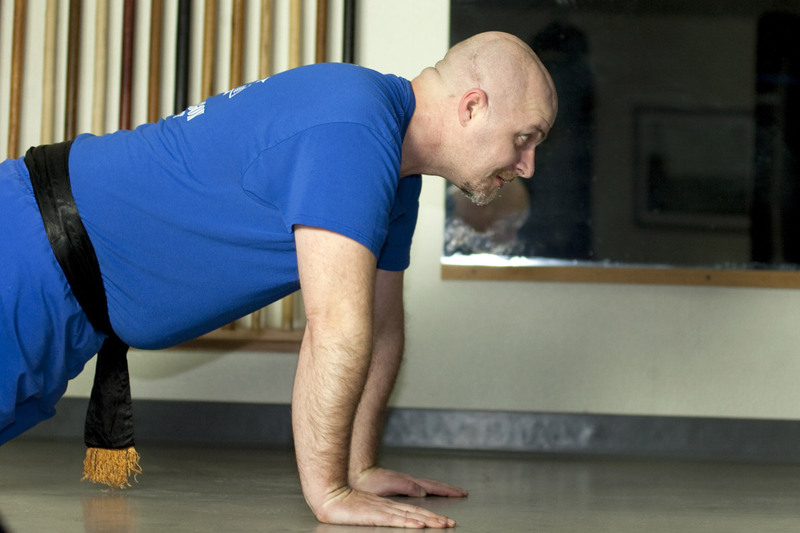 Four weeks after arriving at the hospital, Dan was finally in “stable” condition. A few days later, hundreds of people gathered at a memorial motorcycle event held to benefit the families. With Dan’s physical body healing the way it should, the McFarland’s needed to address the damage caused by his TBI. Dan was transferred to Craig Hospital in Denver. It was then, more than six weeks after the crash, that Melanie decided to share the book. Dan’s first reaction was to comfort Melanie. He had finally seen all that she’d been through during the days at his side. But as the days passed, and Dan continued to look at the book, the emotional reality of losing his friend set in. In his grief, Melanie saw strength. Dan still had a lot of recovering to do. He could dress himself, but because the injury affected the right side of his brain, he’d do things differently, such as brushing only the teeth on his left side. On Sept. 7, 2018, Dan was well enough to go home. About a month later, he was cleared to go back to work part time while he continued therapy and also cleared to drive. 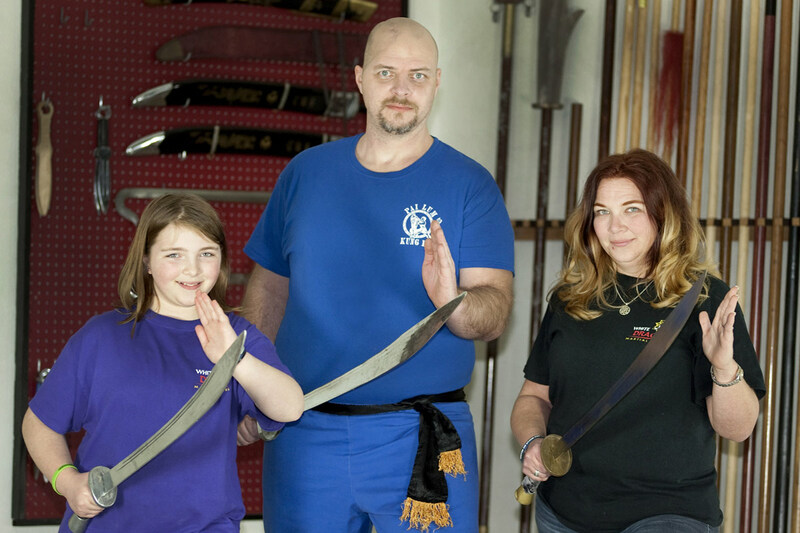 About six months after a motorcycle crash that resulted in several brain surgeries and orthopedic work on his leg, Dan McFarland (and now, Melanie and their daughter) has returned to practicing Kung Fu with Sifu Mark Dill, an instructor at Pai Lum White Dragon Martial Arts in Longmont. Photos by Joel Blocker Photography. Dan’s recovery is nothing if not miraculous, considering that at one point, he couldn’t breathe on his own. He battled for five weeks at MCR, six weeks at Craig Hospital and returned to MCR for 20 days of outpatient speech, physical and occupational therapies. When he arrived at MCR rehabilitation, he was in a wheelchair, and then progressed to a walker, a quad cane and a cane. 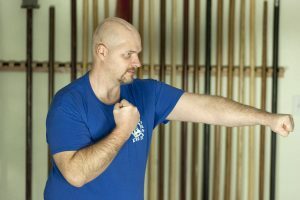 When he hadn’t yet been cleared to return to one of his passions, kung fu, he started tai chi to improve his balance – physically and mentally. 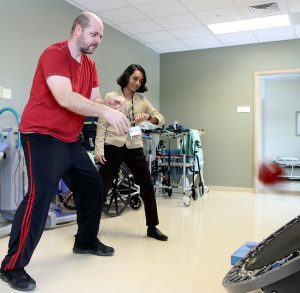 UCHealth physical therapist Rashmita Patel times Dan McFarland as he completes his last day of physical therapy at UCHealth Medical Center of the Rockies after his motorcycle crash five months before. Photo by Kati Blocker, UCHealth. Dan still gets tired easily but he feels fortunate that most of his challenges are physical in nature. “I still have a long way to go,” Dan said. He’s always been a “big-picture” thinker, an information technology expert who monitors government-run systems. Now, he’s back to work, back with his family and back with his wife. They plan to get remarried this summer. Dan is still coping with the loss of his friend, John, and that will certainly require more healing time. For every day, though, he is grateful.